The precedent-setting trade infringement case that pitted a spiritual non-profit against two anonymous bloggers has finally reached a settlement, though the bloggers are calling it a victory. It began two years ago, when Art of Living Foundation subpoenaed the identities of two bloggers who claimed to have defected from the organization, and were now calling it a "cult." In its complaint, Art of Living accused John Does Klim and Skywalker of disclosing the organization's trade secrets, since Skywalker had published several documents and manuals on his site in order to prove they were a sham. Many free speech analysts — including lawyer Matt Zimmerman of the Electronic Frontier Foundation — say the organization used trade infringement as a legal avenue to suppress the bloggers' free speech, since it didn't actually have a foolproof libel case. But the defendants wouldn't give up that easily. Although Skywalker did remove the manuals at Art of Living's behest, he and Klim both refused to reveal their identities; rather, they sought the help of First Amendment attorney Joshua Koltun to fight the case. It culminated a few days ago in a settlement that was incredibly favorable to the defendants, Skywalker reported in a triumphant blog post. (The headline: "The Lawsuit Is Over ... and We Won!") 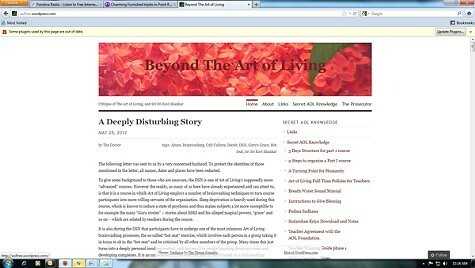 In the end he agreed to freeze his blog, "Beyond the Art of Living," and publish a joint statement explaining the terms of the settlement to readers. In exchange, Art of Living had to drop the lawsuit without prejudice, pay its own attorney fees, compensate the bloggers' attorneys fees, and agree to never again prosecute Skywalker, Klim, or any of their contributors. Moreover, Skywalker wrote, "nothing prevents me or any other person from starting up a new blog critical of AOL." While Klim and Skywalk are both confident they would have prevailed had the case gone to trial, they've taken this resolution swimmingly.